It's really really important to have an early start in life! This has been my new mantra for my life. This is true for almost everything, although it's not a good idea to generalize something! However, I just wanted to emphasize how important it is to be early in doing something. Let me give you a hypothetical example to help you understand what I mean. Suppose, I graduated recently from my university, but didn't work while I was in my college or the university. This will translate into facing difficulty in getting a job after graduation. Employer always want people who have both academic qualification and some work experience. So, if you are early enough to realize this and start somewhere to collect work experience, say through volunteering or internship even if you cannot get a regular job, then you will be more qualified, more eligible and more likely to get a job. You will definitely increase the prospects of finding a job soon after your graduation. Also, let me give you my own real experience. I started blogging about five years ago and I have had a lot of experiences, ups and downs, during this period. However, now I have managed to put myself somewhere in the middle of my journey; I learnt about writing, improved my language skills and vocabulary, and am pursuing my passion to do something challenging and innovative (an entrepreneurial activity) by preparing myself for this. Something I started five years ago started bearing some fruits after a year as I made some money, as I got good grasp of what an online business is, and other benefits that I talked earlier. Now it makes even more sense as I find myself more knowledgeable and confident in my actions and behaviors. Early start has great future implications. Why not retire early and enjoy some years of our life doing something purely whimsical and dreamy - the thing we always wanted to do in our life but couldn't manage? For that, you would have to have an early start in retirement saving, which means adopting careful spending habits, thus increasing the savings. Making life easier and joyful is the dreams of everyone, but we tend to find these two goals contradictory. Life can be made easier by reducing both income and expenses, but we tend to lose happiness. However, better organization can add more value to both work and leisure in your life. Early start, will mean organizing sooner (asap) to get the benefits faster! So, as an aspiring entrepreneur, being an early bird means pushing your own limits every time you do something and complete your tasks early. It means going out of your own comfort zones without any hesitation and then doing something you would have otherwise postponed, or completely dismissed altogether. Well known investor and businessperson, Warren Buffet started investing at the age of eleven and he still regrets for not starting earlier! At what age did you start investing? And do you still think you were early in your entrepreneurial activities? I would love to hear from you in the comments, especially for the second question! Being an early bird also means avoiding the habit of postponing our work. By avoiding procrastination for a day, you could avoid procrastination for other days as well because, the work of today don't get accumulated for tomorrow. For an entrepreneur, being early might mean grabbing an opportunity, which would have otherwise been missed out. 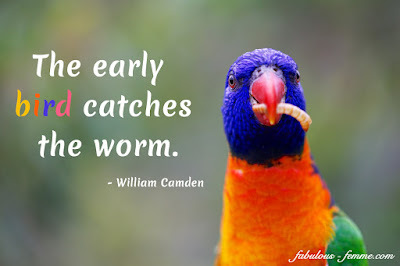 Moral: early bird catches the worm! Nicely presented bro!! Definitely being an early bird will always give you an upper hand and keep you a step ahead of others. I myself have reaped some of those benifits you mentioned earlier as I started my blogging at the age of 15 itself. The important lesson I've learned is that one should come out of his/her comfort zone and overcome procrastination so that we can reach our goals sooner. We however tend to forget this at times and go back to doing things of no/little value in sense of temporary and immediate happiness. But, its to be remembered that greatest happiness is achieved only when you complete the task which you have dreamt to do. As I write this, I'm thinking of finishing a part of my office work today itself before going to bed. Further, to answer ur query, I still feel I started late. I can see many young kids who are enthusiastic about certain things and they are pushing themselves to learn a lot about such things. Though, they maynot have thought from career prespective at the moment, what they are doing is laying down a strong foundation of enthusiasm and persistency which are going to be their foundation in future.